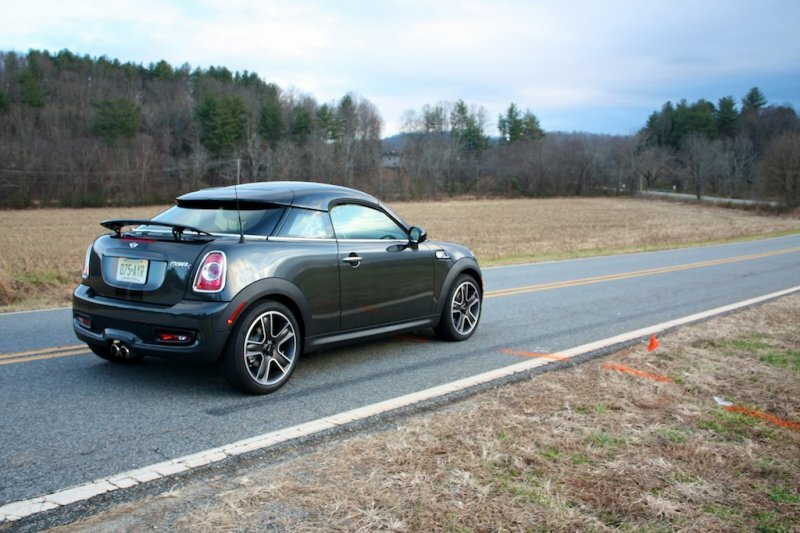 We take the new 2012 Mini Coupe around BMW’s Performance Center track, the NC mountains, and regular streets for a week. 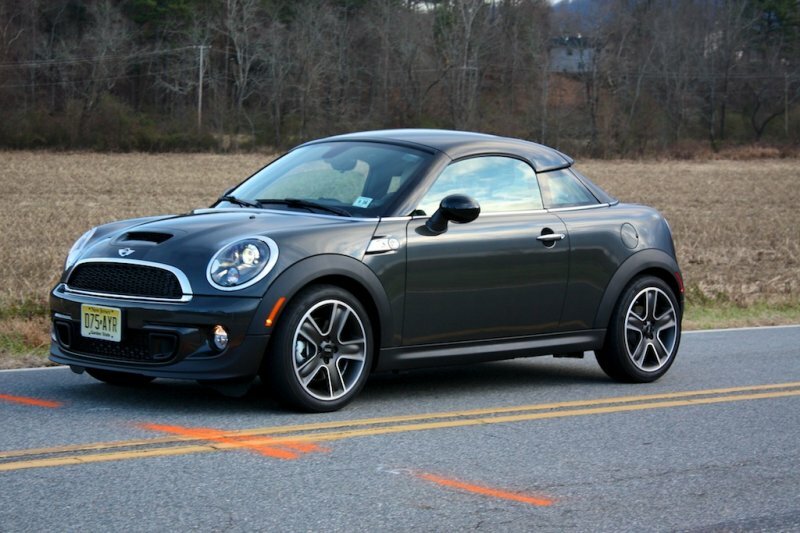 BMW and I had decided that since Greer, SC isn’t too far away from my house in North Carolina, I could come down and take the new 2012 Mini Coupe around their track at the Performance Center. I was giddy like a school kid about to meet a famous celebrity for the first time. I was so excited, I brought my own racing helmet along, only to find out upon arriving that I wouldn’t need it, because I wouldn’t be carrying those kinds of speed around the track. Sad face… They said I could wear my helmet if I really wanted to, simply for the cool factor. However, I refused to be that guy on this occasion. I arrived on a Monday morning with one of my friends, Tom, in tow, signing release forms for the two of us in case anything bad happened. I knew I’d be fine, but Tom, I’m never really so sure about. 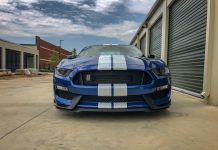 I talked to Matt Mullins, the head instructor at BMW’s Performance Center, and Greg, who’s last name will remain silent because he probably isn’t looking for the type of fame RawAutos can provide him -none. 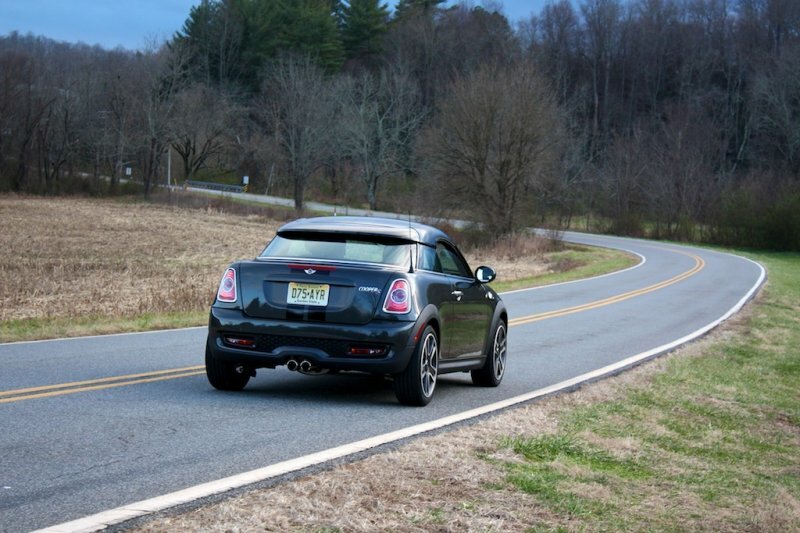 We mainly talked about the new 6 Gran Coupe that had just been released shortly before, but then we got down to brass tax: Checking out the new 2012 Mini Cooper S Coupe. 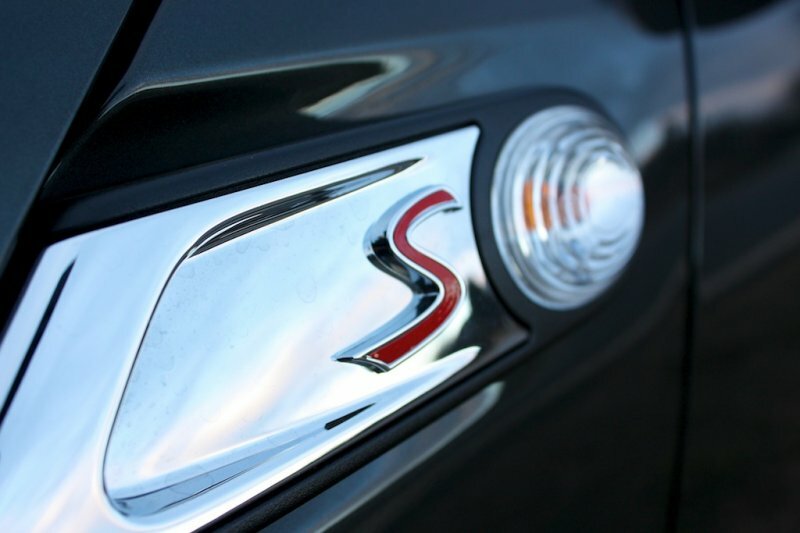 My particular car started out with a base MSRP of $24,600, excluding destination charges. 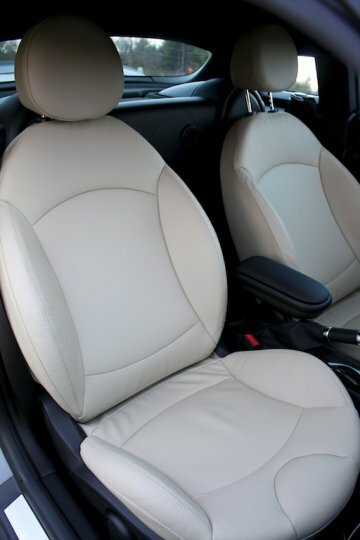 The color and options are listed as: $500 for Eclipse Gray Metallic with black sport stripes; Polar Beige Gravity leather at $1,500; $1,750 for Mini Connected with navigation; $1,500 for the sport package, which gave me 17″ black bullet alloy wheels, xenon headlights, dynamic traction control and white turn signal lights; Sport suspension, oddly enough, is an extra $500 charge; $250 for the Chrome line exterior with $100 going for black headlight housings; $250 for a center armrest; and $700 Harmon Kardon sound system. Add on a $700 destination fee and you’re staring at a $32,400 Mini Cooper with just two seats. Honestly, I do believe that Mini charge a bit much for stuff that should be standard, such as a center armrest. Why isn’t that standard? Oh, and why not a sport suspension with the sport package? Isn’t that the reason why you buy the sport package for a Mini? While I know this may sound like a lot of money, try and look at it as something else. 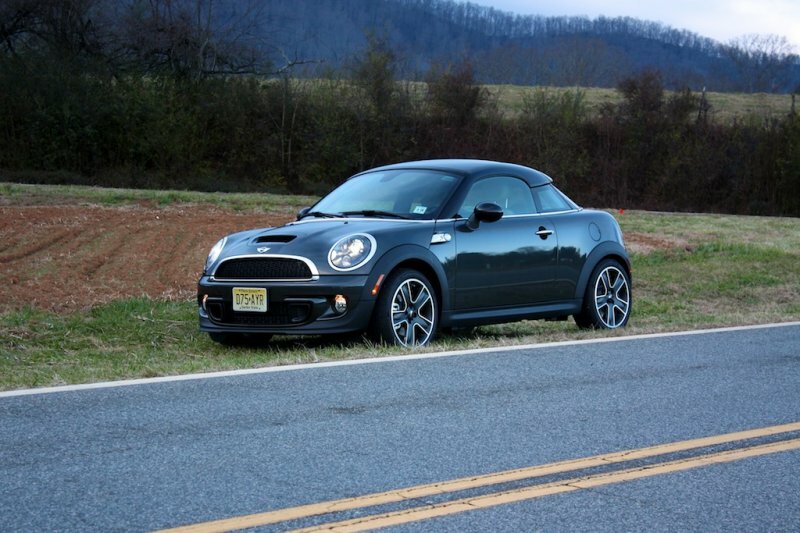 After a week with the Mini Coupe I started to actually believe that Mini hadn’t created a car of their own. No, they just made a front-wheel drive version of the old Z3 coupe. A car that I dearly love, especially in M guise. 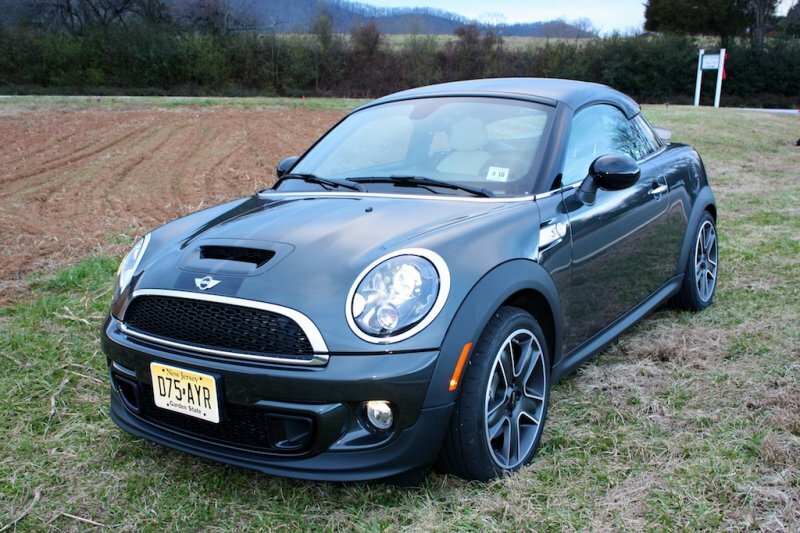 But, I will agree that at over 30 grand, with very little competition, the Mini Coupe doesn’t look all that appealing from your checkbook’s point of view. Let’s get started by telling you the track tale before getting into the ‘is it worth it’ conversation. 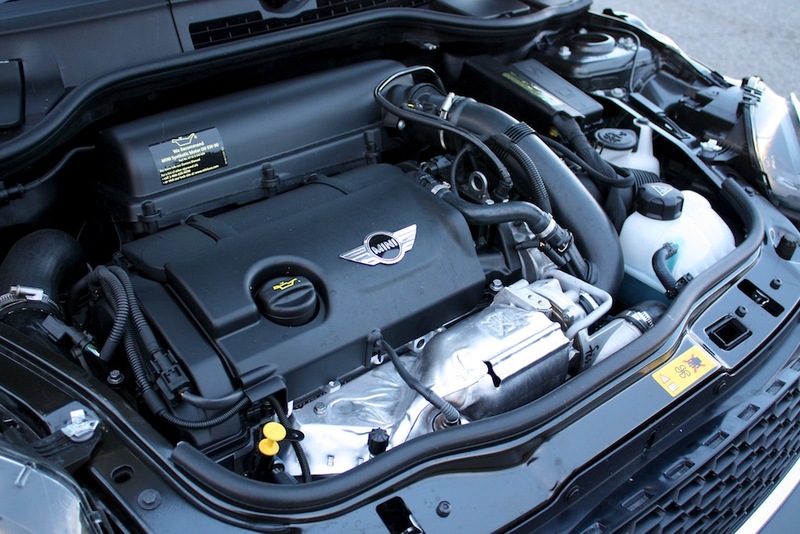 The Mini Coupe in Cooper S form comes with the same 181 hp, 192 lb-ft of torque TwinPower turbo 4-cylinder that the standard Mini hardtop comes with. Matt and Greg led Tom and I out to go see the Mini Coupe, and upon first glance, I still believe it’s uniqueness is clever and cool looking. 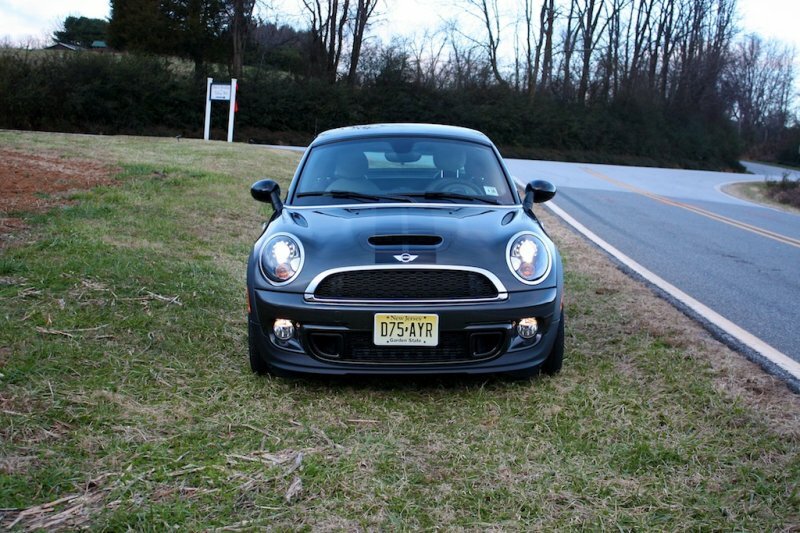 Then again, I’m a Mini fan, previously owning a 2005 Pepper White Cooper S with a 15% supercharge pulley, cold air intake, and an M7 carbon fiber shift knob. We chatted about our first impressions, with Matt soon turning to Tom and I and saying, “If there’s anything else you’d like to drive while you’re down here, please, feel free…” Tom just looks at me for slight approval. A face he usually has when he knows he’s about to use up my own personal favors for himself. I just give him a small grin allowing him to do what he wants. Matt then says, “I noticed you’ve been eying up that 1 M, Tom,” as he damn near jumps out of his Pumas for joy. 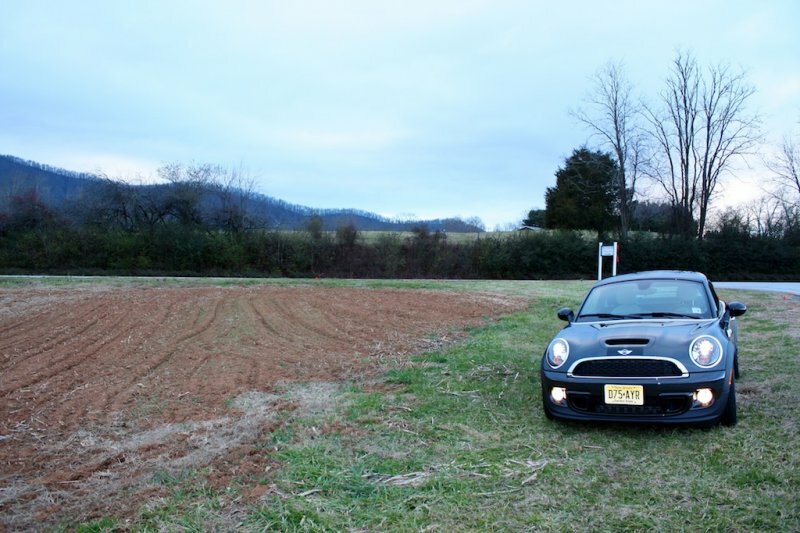 Matt grabs the keys to his E92 M3 DCT instructor’s car, Tom gets the 1 M’s keys, and I jump into the Mini, excited to drive it on any road surface, much less a test track. We head out, taking it easy the first couple of laps, just kind of feeling the cars out a bit. I allow Matt and Tom to get farther ahead of me before I proceed to my seven-tenths pace, getting a little more aggressive each short lap. 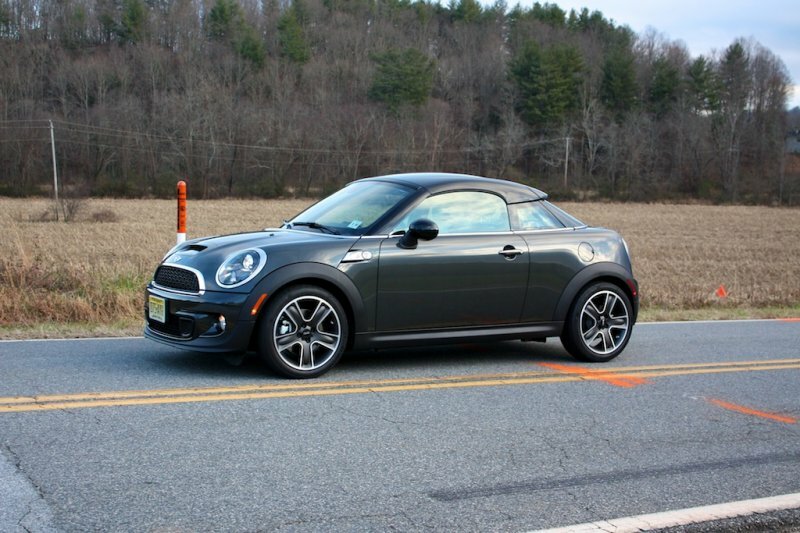 I notice that the Mini Coupe is much more comfortable driving fast than my old Cooper S, and even though I felt a little bit of a weight difference, about 100 lbs heavier than the standard Cooper S -still less than 2800 total lbs- you feel a little extra rear-end happiness around a smaller track like BMW’s. 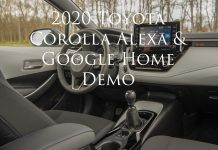 You still feel that understeer at the higher limits, yet it’s less noticeable if you’re not driving very aggressively. I also noticed, to my delight, that the gearshifts are much smoother and more direct than my Cooper S, however on the track it translates to a slightly slower and lazier feel, almost as if it’s a little soft and light. 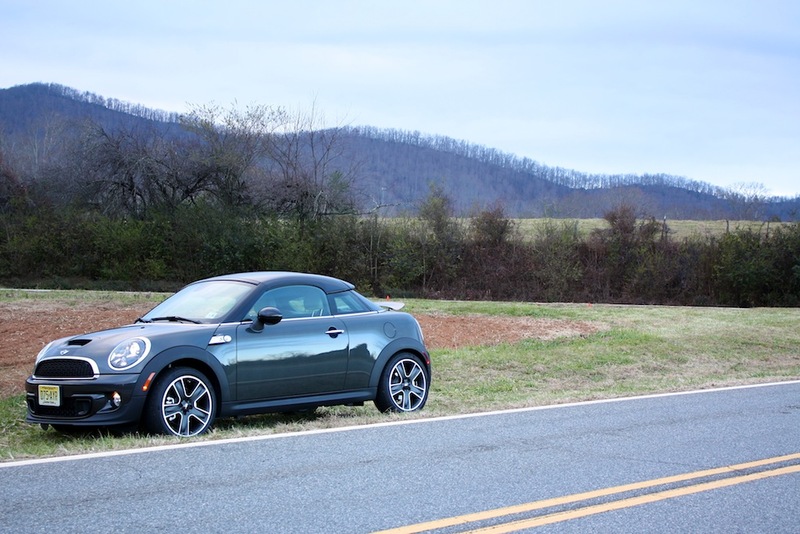 After my couple of hours trading cars on the track, Tom and I drove off in the Mini Coupe and had some lunch, revisiting the greatness of the morning. 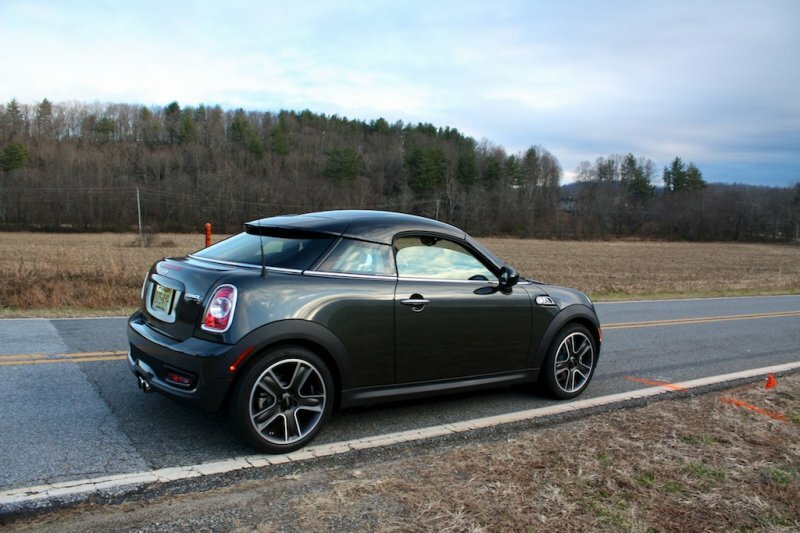 I was surprised when he said to me, “Ya know, I was expecting the Mini Coupe to be a slow dog after getting out of the 1 M and into it. But it wasn’t at all. It held its own and was a memorable drive because of how much fun it was.” Coming from Tom, that’s saying a lot. Typically, if it doesn’t have lots of horsepower and wild grunt, it isn’t really worth mentioning. 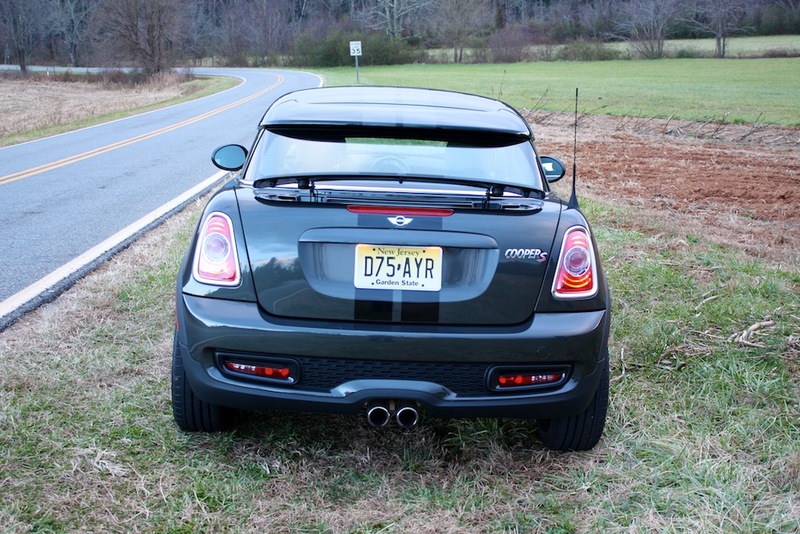 However, he did enjoy my last Cooper S.
The Mini Coupe is very interestingly, if not boldly styled. The roof that you see is supposed to look like a backwards baseball cap, leading many to say that the car was ugly. I definitely disagree. While it’s not a pretty car, I would never say it’s ugly. If anything, it’s cool and positively drawn out. 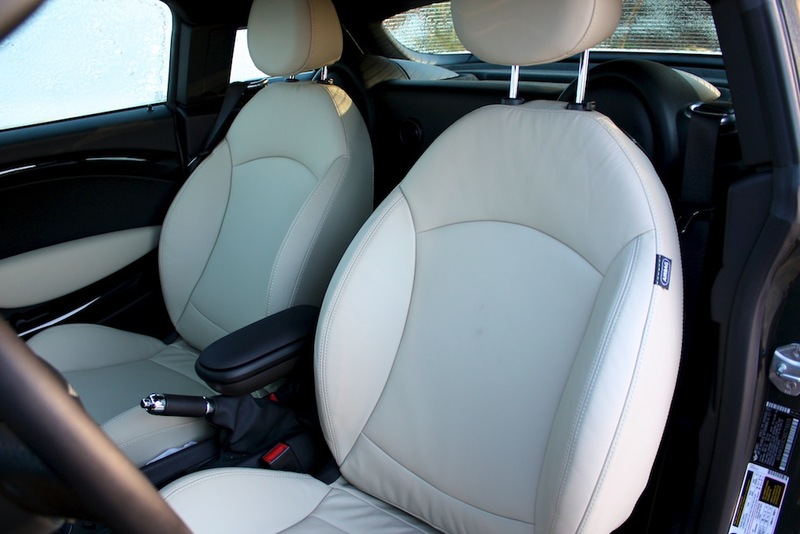 Even though the Mini Coupe suffers from having only two seats and being slightly cramped inside, it’s not uncomfortable. I’ve read other reviews and talked to fellow journalists who believe it’s uncomfortable with a harsher ride. 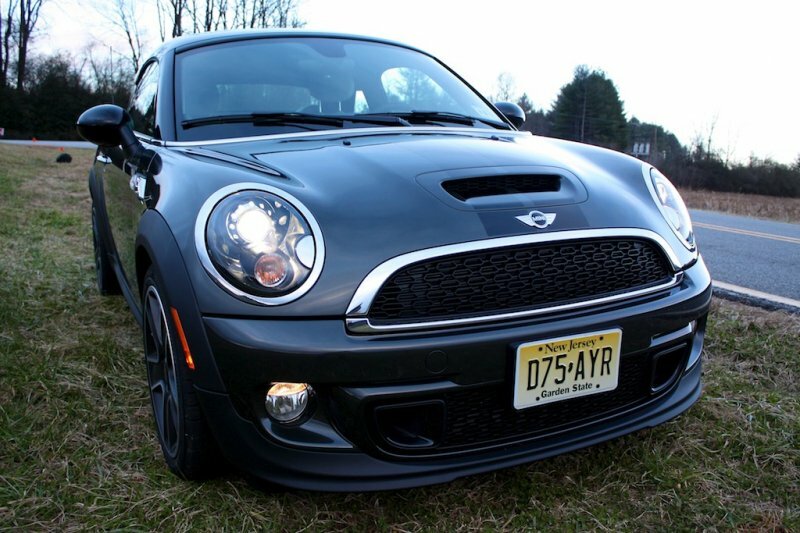 My 2005 Cooper S was a harsh ride. The 2012 coupe is refreshingly comfy, and takes the bumps and bad roads of the southeast a lot better, let me tell you. 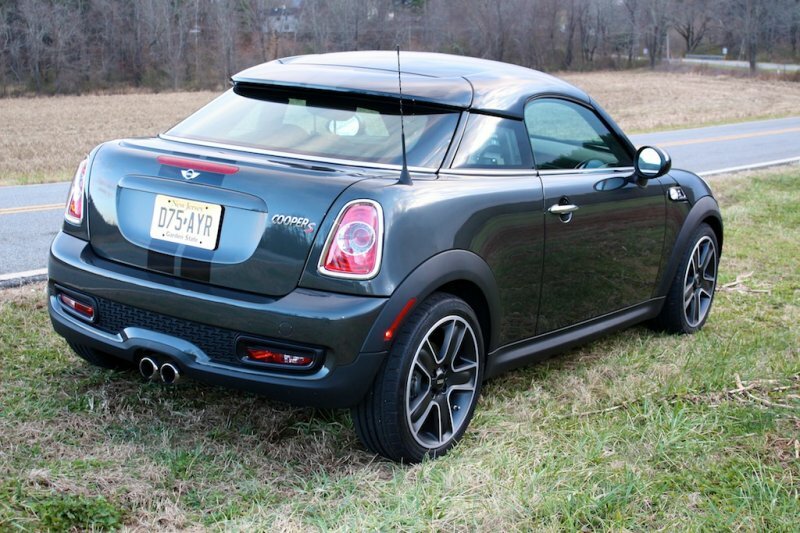 Although, I can say that you’ll never confuse the Mini Coupe with being a luxury car, that’s for sure. 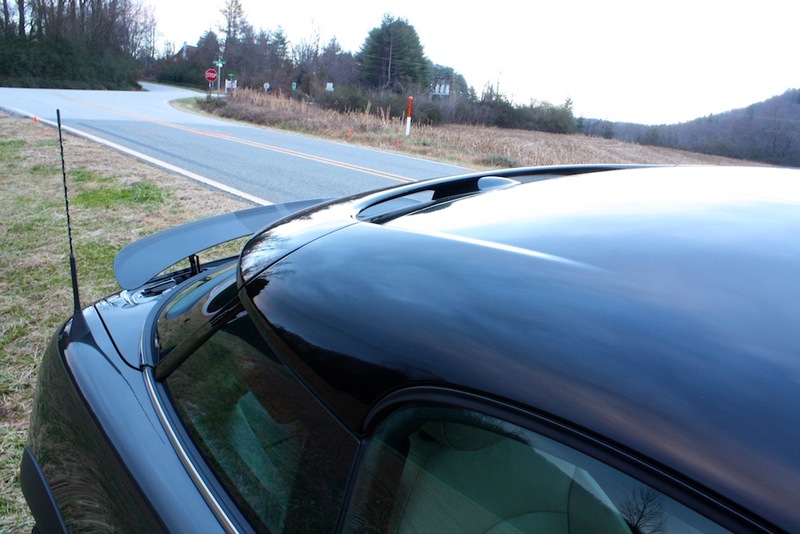 Driving through the mountains of North Carolina, the Coupe stacks up very well and always feels planted and ready to be pushed around public roads. 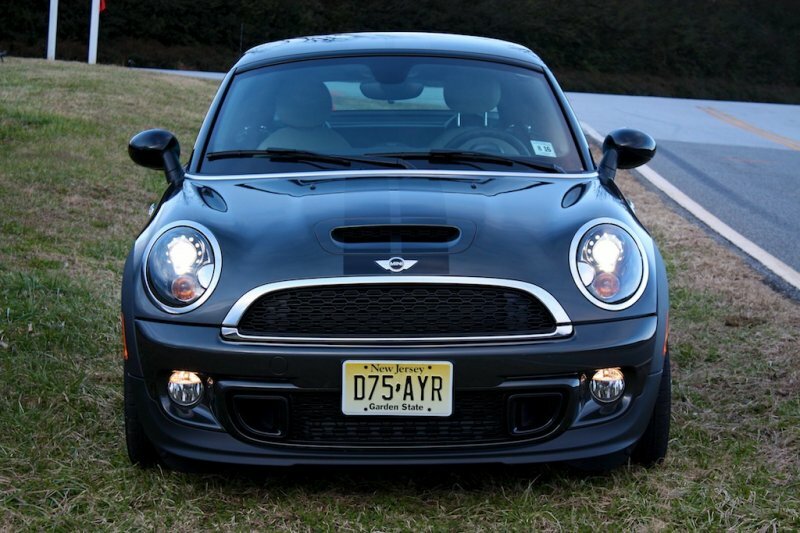 Going too slow will cause the Cooper to not enjoy itself, and it’s a car you want to rev high and happily. 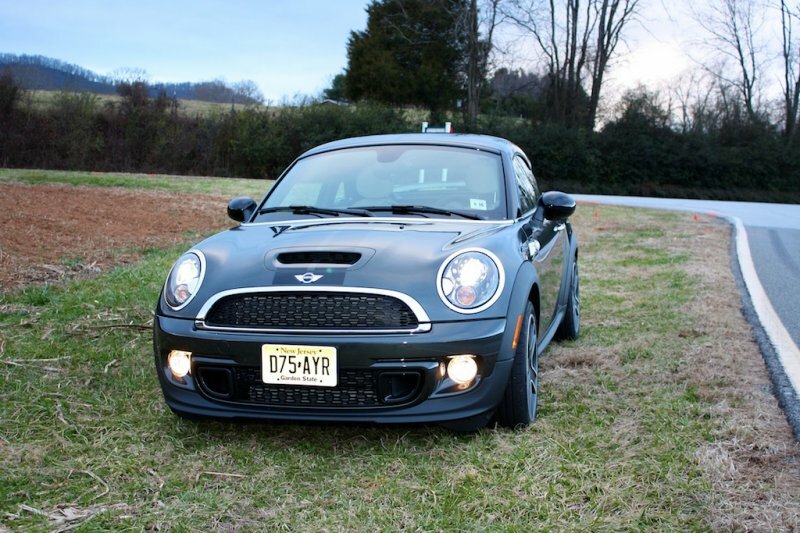 On the boring highways back to Raleigh, NC, the Mini was fantastic, eating up miles with relative comfort and ease. 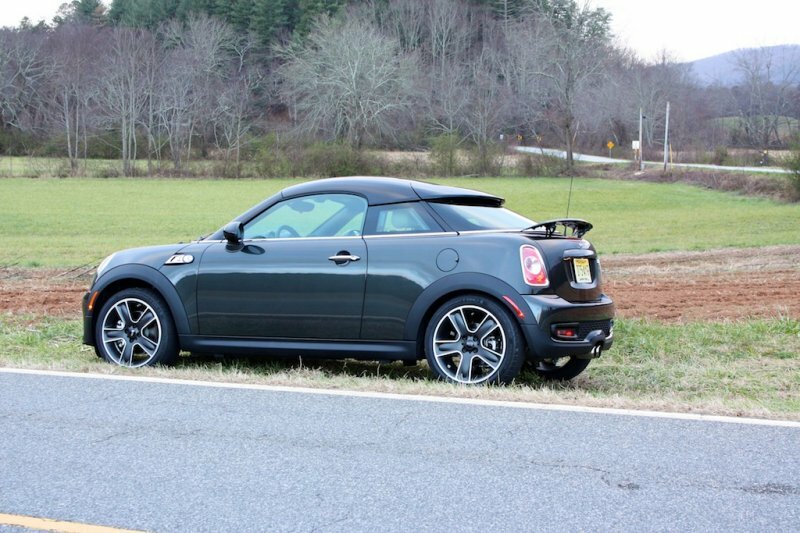 When pushing the Mini Coupe to the 100 mph zone, you feel surprisingly planted and heavy on the road. Not tank heavy, so you certainly know you’re doing 100+ mph, yet it’s not scary. 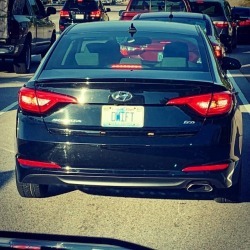 Starting from BMW’s Performance Center track, going to the mountains, then back to my home -a roughly 4 hour drive from the mountains to my house- and then back to Greer, SC a week later, I was more impressed with the gas mileage than anything else. 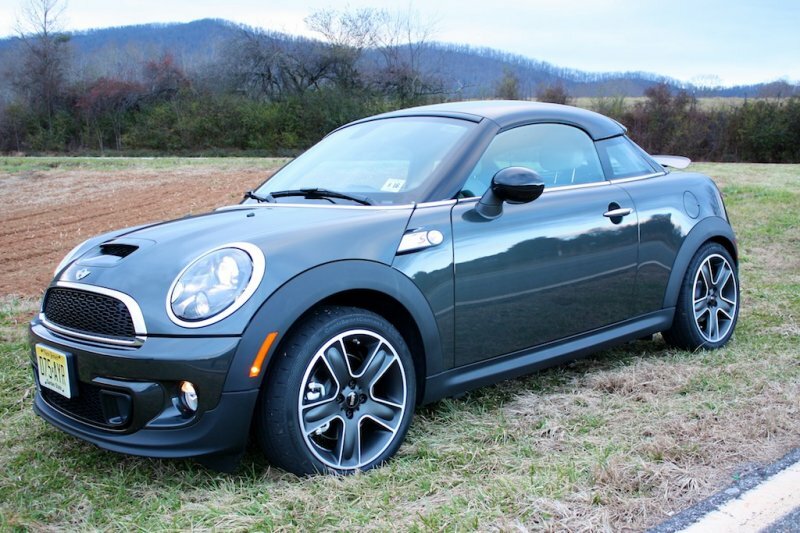 BMW rates the Mini Coupe at 27 city and 35 highway mpg, yet I returned it to BMW averaging 29.3 mpg between city and highway, with track time, high speed runs, and lots of mountain road fun. All in all, I think that’s great, and the first time I filled up after I drove it to empty, I was sitting at 410.5 total miles on the tank. 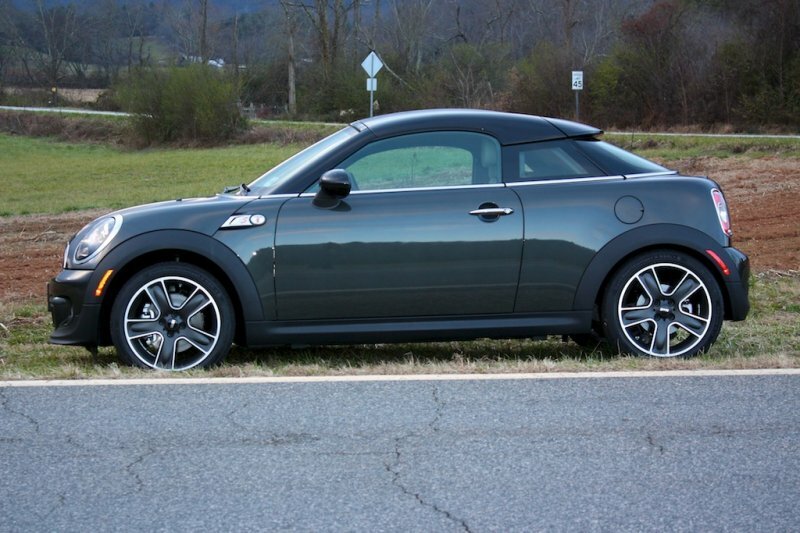 Again, taking into account the hard driving I did, I think the Mini Coupe is excellent in that department. And don’t forget it can hit 60 mph in about 6-seconds flat. There are a few faults that should be mentioned. 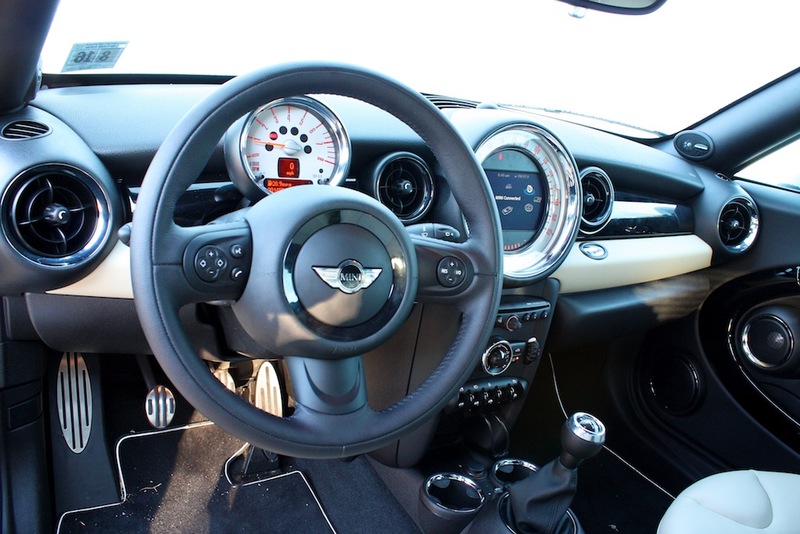 The Mini Coupe doesn’t really have a lot of blind spots, it’s small enough to see around them with the mirrors pointed properly. 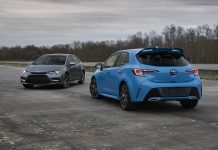 But when the rear spoiler pops up at 51 mph -it goes back down at 37 mph- you can barely see much out the back window, which is already small enough as it is. So to say rearward visibility is limited would be putting it gently. 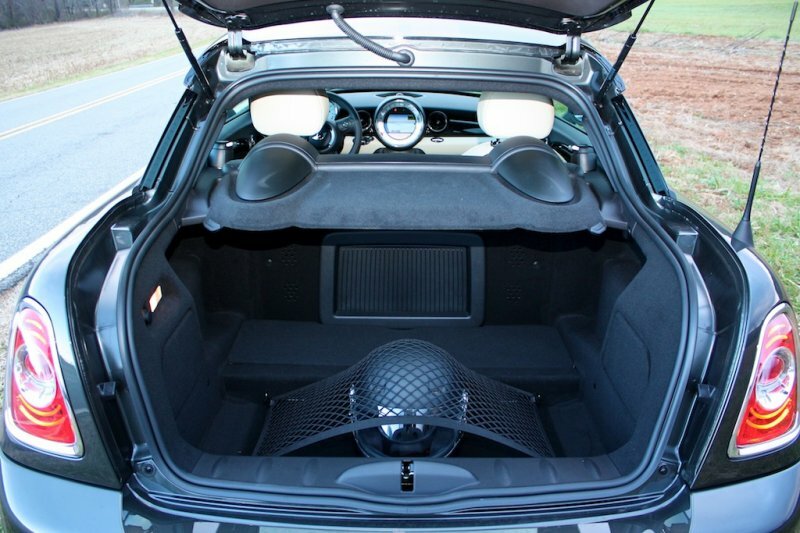 Also, headroom was just fine for me at 5’9″, but I know anyone in the 6 foot range is going to struggle with comfort and will probably be tilting their head to drive the Mini Coupe. 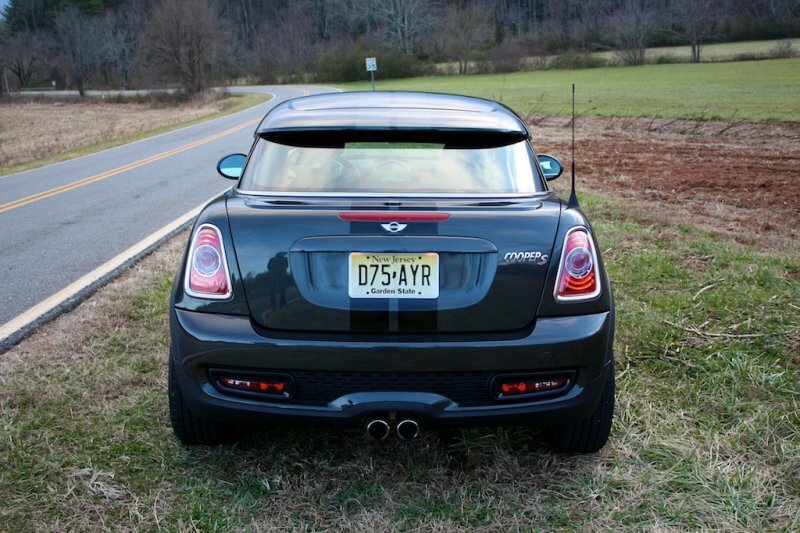 Something that totally redeems the Mini Coupe of any issues with size or interior space is the rear hatch. Opening up the back shows a nice sized trunk for a good amount of stuff. I had my camera, laptop and clothing bags all with me, as well as my racing helmet snug under the elastic mesh area. 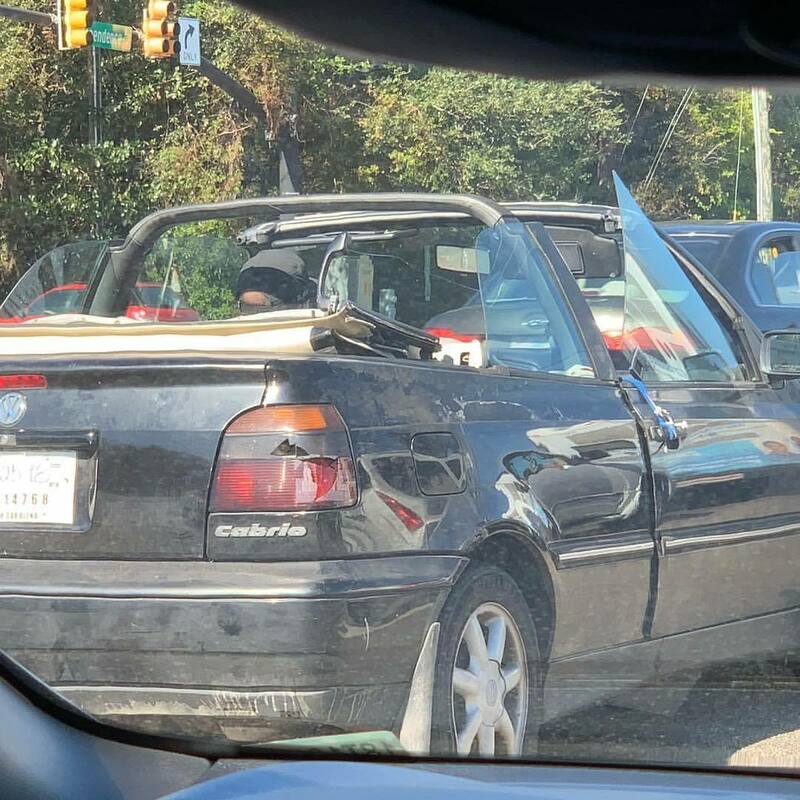 Yet even better than that is how you can get to your stuff without ever getting out of the car. 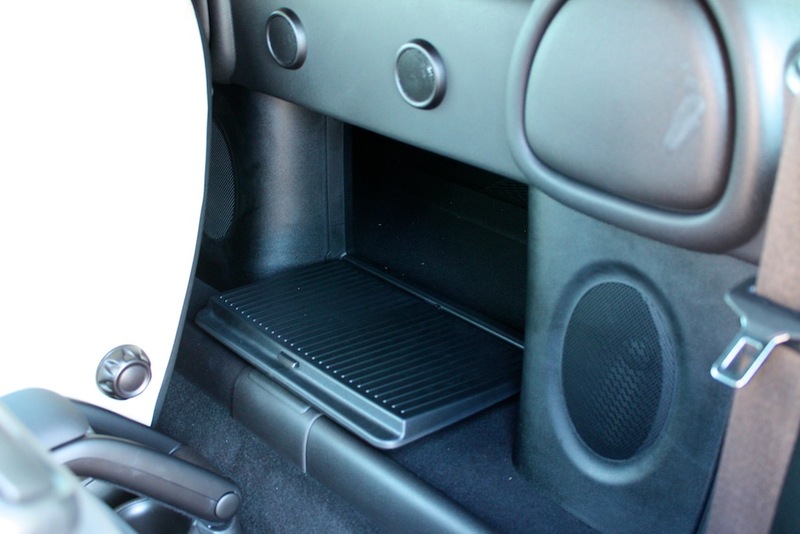 There’s a little cubby hole with a locking door that leads you straight to the hatch area. 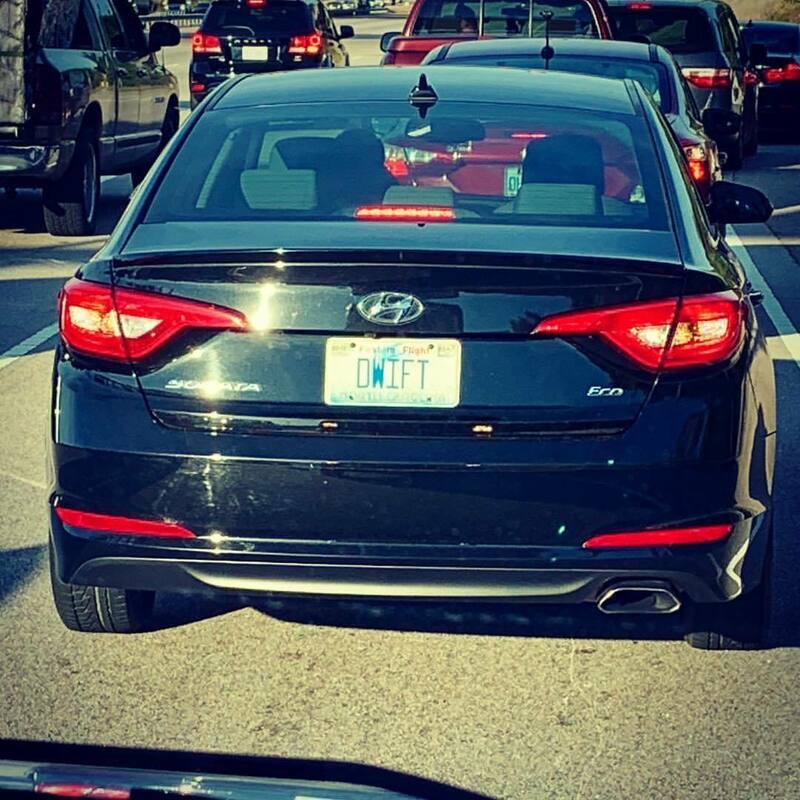 I had left something in the trunk while driving and didn’t feel like pulling over on the highway, as I was making great time. I opened the door, reached my right arm through without disrupting my driving, and pulled out what I was looking for. It was genius, and kinda felt like pulling a rabbit out of a hat. And speaking of the trunk, because I had the Mini Coupe shortly before Christmas, I drove some gifts from my parents’ house over to my sister’s for her to wrap (she loves wrapping everyone’s gifts. No really, she does), and it was quite a few large bags. I already had some stuff in the hatch, but surprisingly, everything fit without having to take anything out. 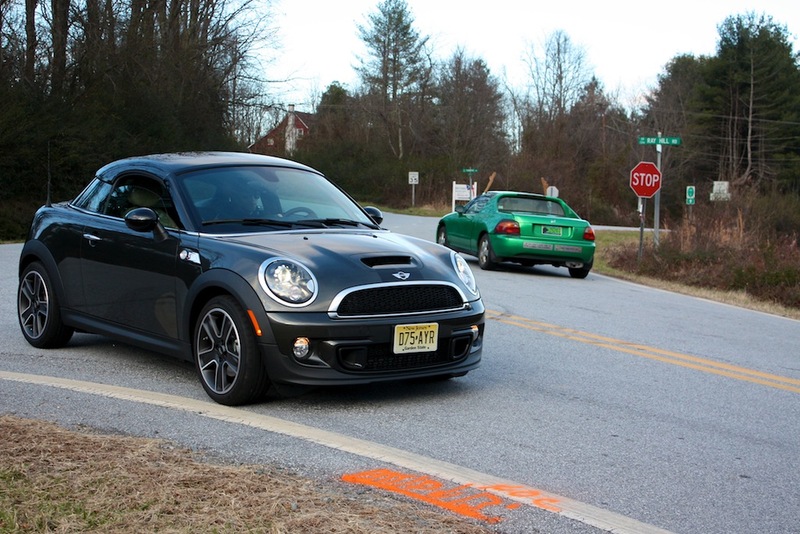 In the end, I felt as though the Mini Coupe was the perfect second car to put next to my BMW M3. 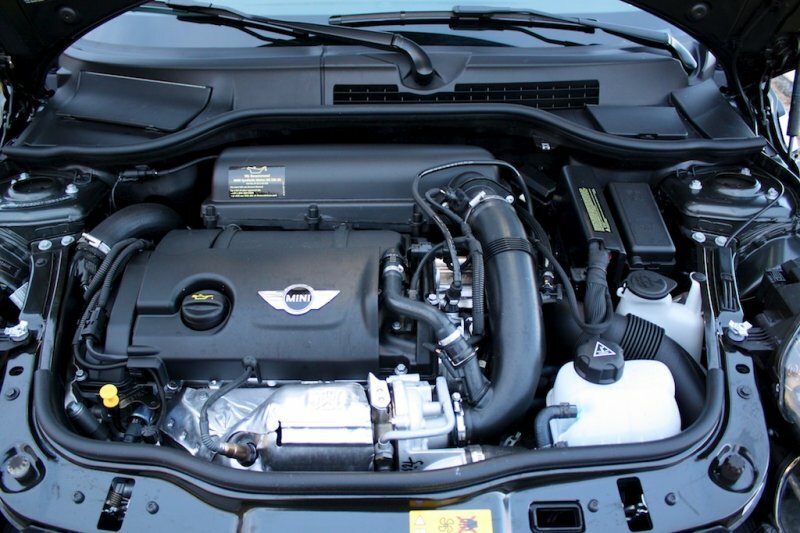 However, I would enjoy more power, maybe about 215-220 hp? I think a car that costs 32,000 dollars should be a bit more powerful, regardless of all else. With that said, Mini have figured out how to make the perfect BMW Z3 Coupe all over again, which makes the Mini Coupe a great deal. 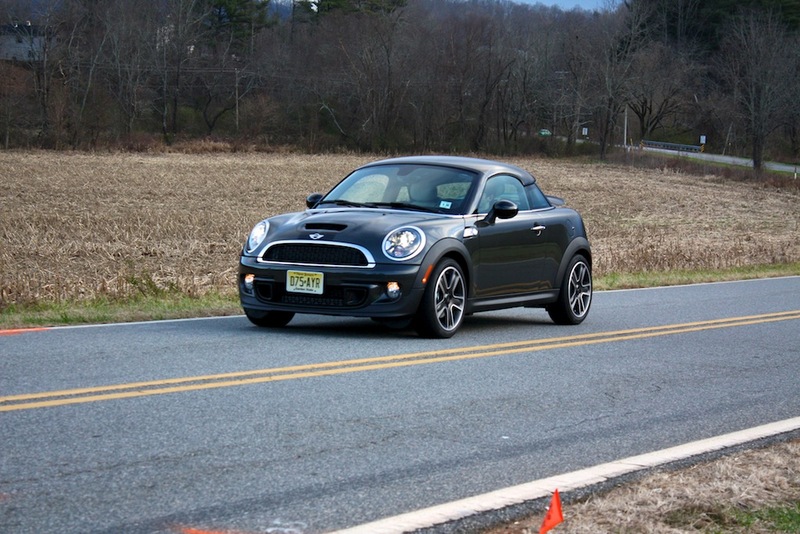 To say I enjoyed my time with the Mini Coupe would be accurate, but to add that I loved its fun factor with great gas mileage would be spot on. 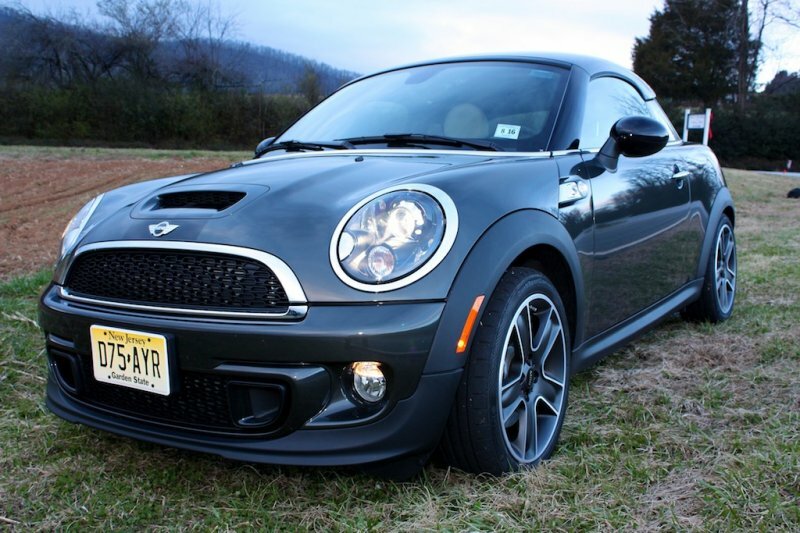 The Truth: The 2012 Mini Cooper S Coupe is a great car for anyone to be seen in, especially since it’s fun and light on its feet. 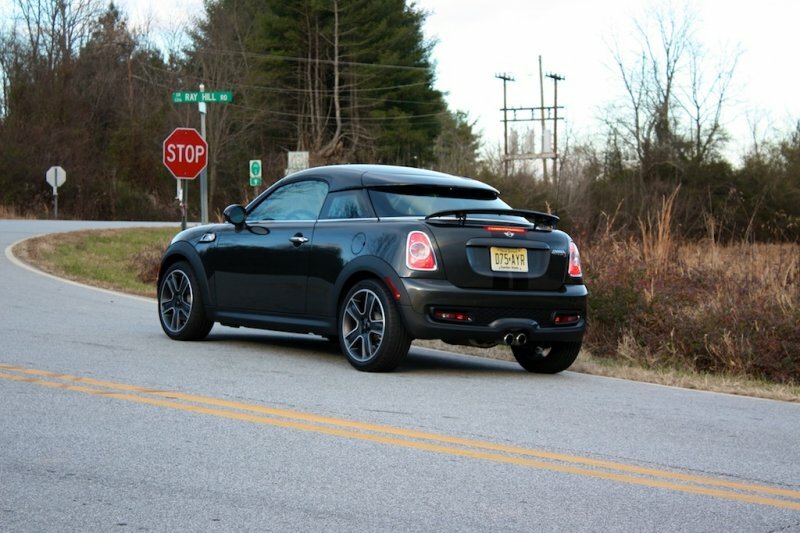 Even though the BMW Z3 Coupe isn’t heralded by many, the Mini Coupe is a better, spiritual successor to it.